StikBots are plastic figures with flexible body parts and suction cups for hands and feet that can be positioned in different ways. Download the free mobile app, Zing StikBot Studio, and you can create your own stop-motion StikBot movie. We first came across StikBots at the Digital Kids Show last year, when J had a go making an animation film. 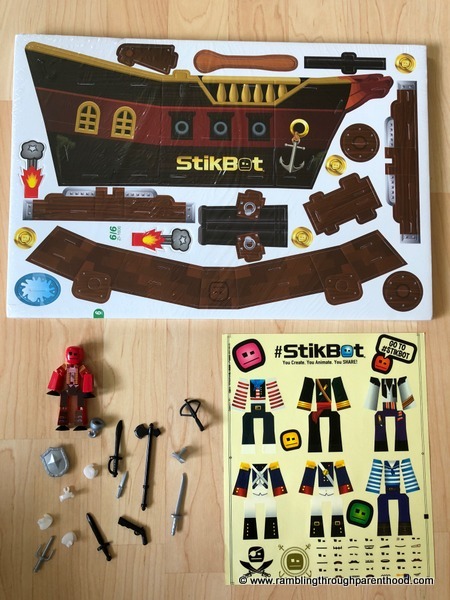 We have now been given the opportunity to review the new StikBot Pirate Movie Set. The StikBot Pirate Movie Set came in a flat-pack box. We opened it to find 6 neatly folded foam boards. One of these opened up to form a double-sided backdrop – a beach scene on one side and a cliff picture on the other. 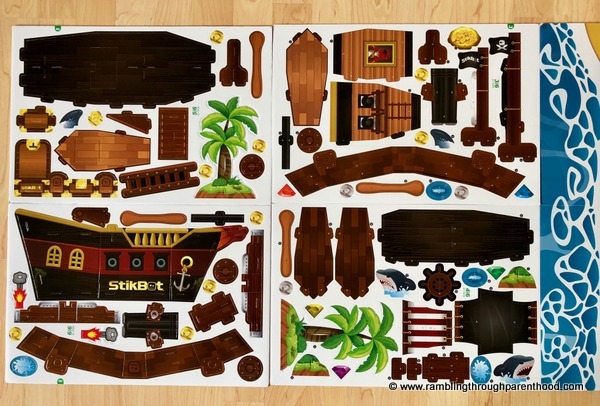 The other 4 foam boards included numbered parts to build the pirate ship and accessories. Also included was an instruction sheet with step-by-step diagrams. It was easy enough to pop out the foam board parts and piece them together to create a pirate ship, two row boats with oars, a pair of cannons and some sharks and palm trees. The highlight was the treasure chest with a lid that flips open and can be filled with coins and jewels. 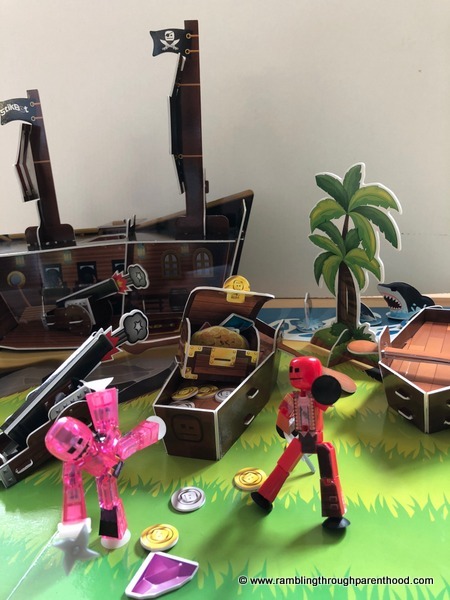 The StikBot pirate ship needs a special mention. It is open on one side, so you can feature the insides in your movie if you so wish. It also comes with a pair of masts, a steering wheel and a plank that naughty pirates can walk. 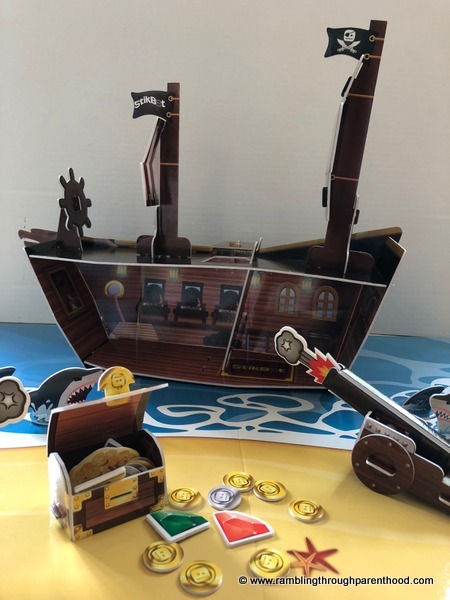 The pack also comes with one StikBot figure, a range of pirate-themed accessories like swords, cutlass and daggers, 4 hand clips that let you clip said accessories to the StikBot and some stick-on clothes if you wish to change the appearance of your pirate figures. We used a large piece of white cardboard as the backdrop for our movie set. You can use something similar, or film against a wall or door. Alternatively, go all out and invest in a StikBot Zanimation Studio to make your films even snazzier. J had a go using the StikBot mobile app to create his own pirate film. It took some getting used to, for making a stop-motion animation means you move the figures bit by bit and take a picture each time. The app then pieces everything together as a film. It is slow and tedious, but a lot of fun and a great creative outlet. Kids can really get into it, drawing up a story board and then directing and filming their own movie. J wasn’t keen on making a story board, but chose to improvise as he went along. Here is the movie he made, all by himself with no adult input whatsoever! His story has a pirate walking the plank and then engaging in battle with another pirate over the treasure. I think it is an excellent first attempt. We will need to work on centralisation and close-ups, but I love how he chose his own story and even managed to add a piece of swashbuckling music at the beginning. 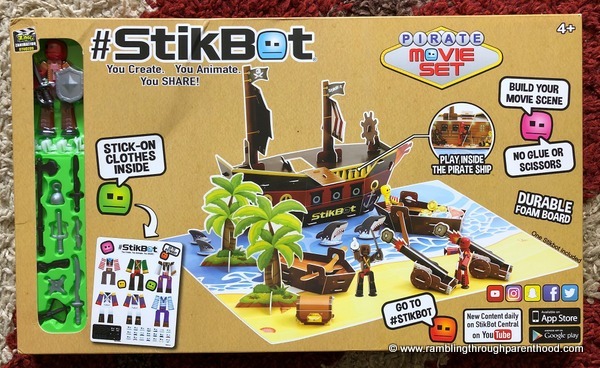 The StikBot Pirate Movie Set retails for £21.99 and is aimed at ages 4+. Disclosure: We were sent a StikBot Pirate Movie Set for the purpose of this review. All opinions are my own.